STATEWIDE—Daylight saving time will end on Sunday, Nov. 4, meaning wildlife movements at dusk will likely conflict with high rush hour traffic volume. As we lose hours of sunlight, Colorado Parks and Wildlife (CPW) reminds Coloradans to watch carefully for wildlife on our roads. With animals on the move for seasonal mating and migration, it is important to pay close attention to wildlife as people adjust to darker commutes. As fall and winter progress, deer will continue to move to lower elevations in search of food and water sources. Motorists are urged to watch for wildlife on the move. "With the fall time change, it stays darker longer in the morning, and gets darker earlier in the evenings," said CPW Area Wildlife Manager Crystal Chick. "People are commuting in less light and increasing their chances for a collision with wildlife. Many of our big game animals are active during these darker hours at dawn and dusk, so we really need people to stay alert when driving, especially in high-risk areas." CDOT also advises motorists to be aware, drive with caution and slow down. "It can be extremely difficult to see deer and other wildlife along the highway when it's dark out. So we urge motorists to concentrate on the road," said CDOT Maintenance Superintendent Greg Stacy. "Our CDOT maintenance crews are called out daily to clear the roads of animal carcasses. These animals have been hit by cars or trucks. We see and respond to thousands of wildlife-vehicle collisions throughout the year." Not only are these collisions dangerous, but the crashes also incur average costs of over $3,000 in property damage, according to the Rocky Mountain Insurance Information Association. One effective measure which attempts to decrease the amount of wildlife-vehicle collisions in Colorado has been the construction of mitigation structures. "Many of our highway construction projects now incorporate wildlife mitigation features," explained CDOT Biologist Mark Lawler. "Animal underpasses, overpasses, deer fencing, jump outs and deer guards are structures that can funnel and direct large game, and even smaller wildlife to cross from one side of the highway to the other in a safe manner for both motorists and the animals." 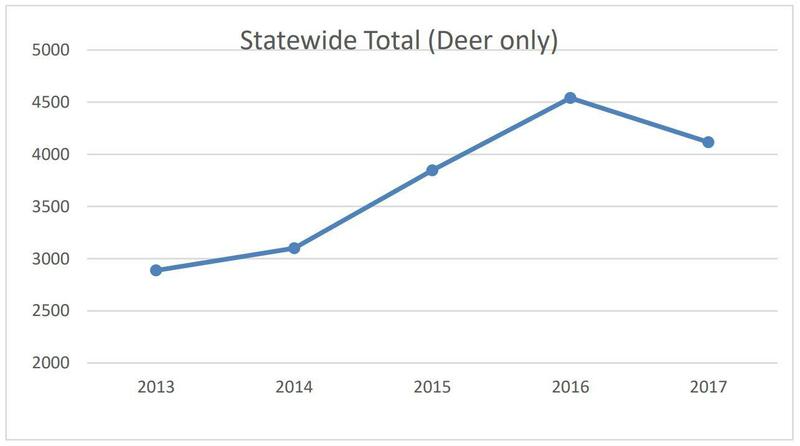 Statewide, roadway deer kills decreased almost 11 percent from 2016 to 2017. Although mitigation structures have been built over and under highways in some areas of the state to help ease the challenge of wildlife crossing the highways, it is up to motorists to always remain attentive to their surroundings and to watch for wildlife on the move. The following precautions are good advice all year long, but particularly around the change back to daylight standard time. Slow down. Traveling at high speeds increases the danger of a crash. Moderate speeds maintain a driver's reaction time and allow an appropriate response to animals on or near roads. Stay alert. Pay close attention to the roadway—particularly while driving between dusk and dawn. 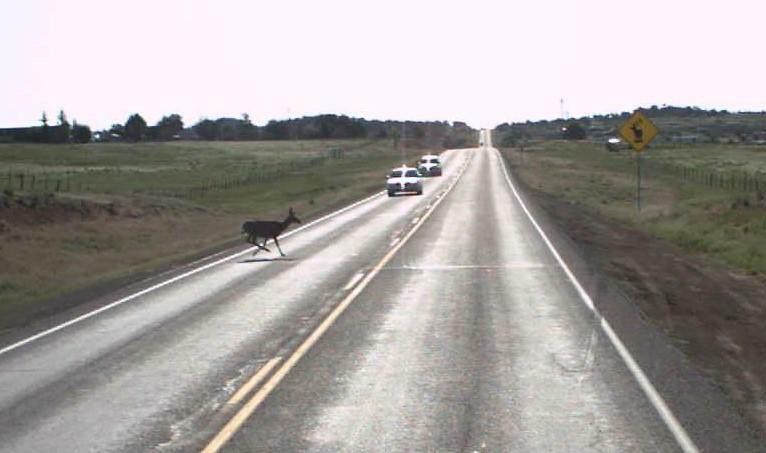 This is when deer and other common wildlife are most active and more likely to be crossing roadways. Scan ahead. Watch for movement and shining eyes along roadsides. If you see one animal, you should expect it will be accompanied by others. Obey traffic signs. Many highways have wildlife warning signs intended to alert motorists of known wildlife movement areas. Though incidents can happen anywhere, transportation authorities attempt to reduce the number of wildlife-vehicle collisions by posting signage and lowering speeds in areas where wildlife are active. Give warning. When animals are seen on or near the road, slow down or stop (if no other cars are behind you), honk the horn and/or flash headlights. This warns the animal to avoid the road and alerts other drivers to the potential hazard. Always wear seat belts. Unfortunately, not every collision is avoidable, and the National Highway and Traffic Safety Administration (NHTSA) states that the risk of serious injury and death in a crash is reduced by half when seat belts are worn. Drivers involved in a wildlife-vehicle collision should report the accident to the Colorado State Patrol by calling *CSP (star key and 277).